Today we continue our Presidential Geography series, a one-by-one examination of the peculiarities that drive the politics in all 50 states and the District of Columbia. Today’s stop: Oregon, the Beaver State. FiveThirtyEight spoke with William Lunch, a professor in political science at Oregon State University, and Jeff Mapes and Harry Esteve, both of whom report on politics for The Oregonian. Like the last state profiled in this series, Wisconsin, Oregon is a difficult state to pin down politically. The last Republican to carry the state in a presidential election was Ronald Reagan in 1984. President Obama won the state comfortably in 2008, and Mitt Romney doesn’t seem to be contesting Oregon this year. But Mr. Obama’s 16-percentage-point margin of victory in Oregon in 2008 was very much out of character for the state. It was the largest win there by a presidential candidate in more than four decades. 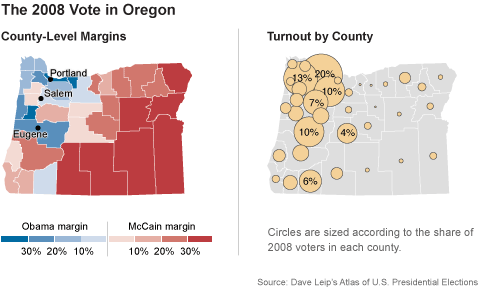 In 2004, Senator John Kerry won Oregon by four percentage points. In 2000, Al Gore eked out a win there by less than 7,000 votes. 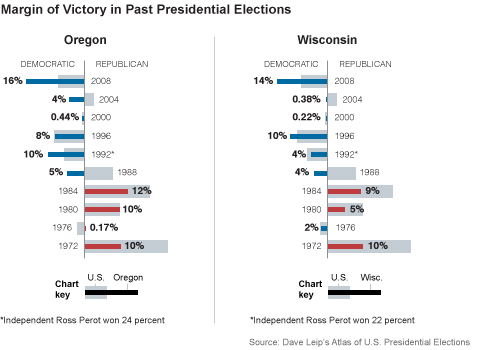 Oregon’s electoral trajectory is actually very similar to the arc Wisconsin has followed. The two states both sit right on the cusp of competitive and safely Democratic states. Oregon, like Wisconsin, is an ideologically polarized state. The Cascade Mountains are a convenient dividing line, politically and geographically. The Cascades, which block moisture flowing inland from the Pacific Ocean, demarcate the wet, green and left-leaning population centers in the west and the dry, brown, lightly populated and conservative eastern half of Oregon. Most Oregonians live in the Willamette Valley, beginning in Portland (Multnomah County), the paramount source of Democratic votes in the state. But Portland was not always so liberal. Through the middle 20th century, Portland was a blue-collar town, and its transition from an industrial, marginally Democratic town to the greenest city in the nation, with bike paths connecting microbreweries and galleries, accounts for a large portion of Oregon’s shift to the left. Traveling south from Portland, the university towns of Corvallis and Eugene are the other two Democratic strongholds in the state. Republicans are more competitive in the farming areas between the main cities in the Willamette Valley. In Mr. Obama’s blowout win in 2008, he carried Marion County, where the state capital Salem is, by just two percentage points. East of the Cascade Mountains is Republican territory, and Mr. Romney will win these counties by large margins. Many residents in eastern Oregon make their living off the land, whether in timber, agriculture or mining. Oregon is still a top lumber producer, but the industry was hurt badly in the 1990s after the federal government passed logging limits to protect the spotted owl’s habitat. That decision — and questions about environmental protection in general — contributed to the polarization of Oregon’s politics, fueling a rural versus urban mentality. While moderates from both sides once prevailed in Oregon, the state is now deeply divided. Eastern Oregon is ruby red and firmly in favor of development. The state’s city dwellers, however, tend to prioritize a clean environment. The division has largely worked in favor of the Democratic Party. Although Democrats now have great difficulty winning in rural Oregon, Republicans have trouble winning statewide. 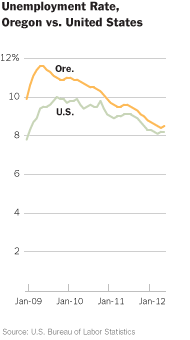 This is because, on environmental issues, Oregon’s suburbs have mostly sided with its cities, Mr. Lunch said, and most Oregonians live in cities and suburbs. Republican candidates in Oregon must “appeal to their rural base, which wants an all-out war on these environmental restrictions, and suburban swing voters, who are more concerned about protecting the environment,” Mr. Mapes said. With Oregon’s liberal cities in the Willamette Valley on the left, and eastern and southern Oregon on the right, the political battle in Oregon tends to focus on Portland’s suburbs, Mr. Lunch said. Specifically, campaigns focus on the swing voters who live in two counties that neighbor Portland: Clackamas County, to the southeast, and Washington County, to the west. 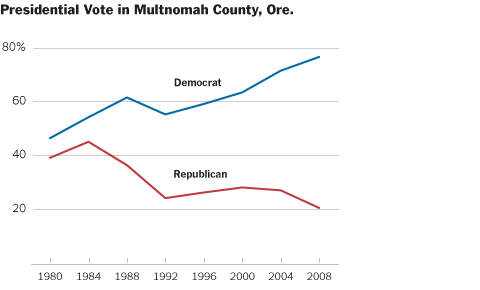 In 2008, 13 percent of Oregon voters cast their ballot in Washington County, and 10 percent in Clackamas County. Washington County, which includes a bevy of high-tech jobs in the Silicon Forest, tends to be a bit more Democratic than Oregon as a whole. And Clackamas County, which is more blue-collar and includes more exurban and rural territory than Washington County, tends to vote a bit more Republican than Oregon overall. So, when taken together, the two counties present a nearly perfect barometer of Oregon’s final statewide vote, matching the two-party vote shares statewide almost exactly in the last three elections. en competitive and safely Democratic states. Looking back to the margin of victory chart above, Oregon has consistently been just a little more Democratic-leaning than Wisconsin. The difference has been marginal, but Wisconsin is included as a battleground state much more often than Oregon. The FiveThirtyEight model, which draws more granular distinctions, currently makes Mr. Obama a 92 percent favorite in Oregon, a few percentage points better than his odds in Wisconsin, 88 percent, before Representative Paul D. Ryan of Wisconsin was added to the Romney ticket. In a truly competitive presidential election, Oregon is unlikely to act as a tipping-point state; in over 99 percent of the model’s simulations, Oregon’s seven electoral votes prove either a given for a winning Mr. Obama or unneeded for a victorious Mr. Romney. In other words, in most competitive elections, Oregon will stay in the Democratic column, although sometimes just barely. But in the context of a Republican wave election, or conditions nearly that favorable, a Republican could carry the state.